MINI Cooper Acccessories + MINI Cooper Parts :: OutMotoring.com MINI Blog :: Car Care Products :: Got Rusty Rotors? Synopsis: Check out this product!- It keeps your rotors from rusting after a car wash or rain! 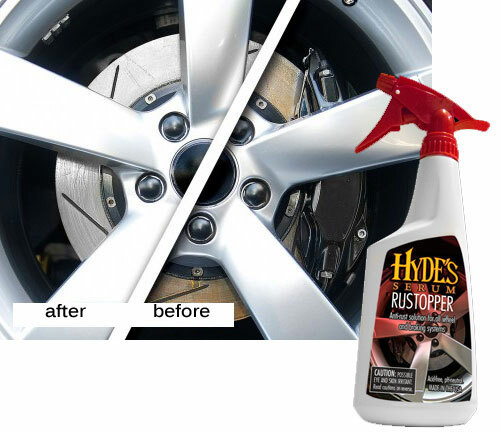 Rustopper effortlessly prevents rust from forming on your brake rotors after cleaning wheels and braking systems. Rustopper was designed to prevent “rust dust” – the initial brake dust on clean wheels that occurs after washing. Rustopper’s Acid-free, pH-neutral formula will not attack wheel coatings, lug nuts or braking systems. Rustopper is safe on all types of steel and alloy wheels (including chrome and polished wheels), anodized finishes and single stage paints. Directions are simple: After cleaning the wheel and braking system, rinse thoroughly with water then apply Rustopper liberally to brake rotor surface and components. Comments on Got Rusty Rotors?